[ vertical ] [ vertical ] You can rotate your head or the screen to see them vertically! Nanotube is sprayed with spray starch for stiffness. Select crochet yarn - something a little stiff is best. 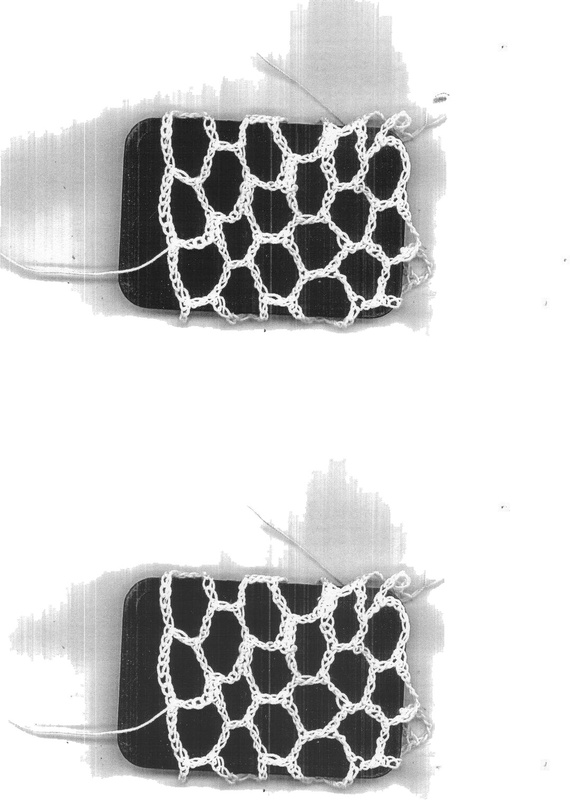 The black nanotube pictured above is done with a DMC cotton yarn used in Israel for crocheting yamulkes, the white one that is used for closeups was done with a thicker yarn used normally for lace doilies. The thicker yarn can be bought at all craft stores, WalMart etc. Select crochet hook of size to give a loose chain. A 1.5 mm hook was used for both of these but a larger one is also suitable. If you do not know how to crochet you could look at these internet stitch guides for chain, slip stitch, single crochet and double crochet. This site and the instructions use American stitch naming conventions, Australian conventions call the American single a double and the American double a treble. An enlarged image of the first 7 crochet rows of the white nanotube is given here, a piece of plastic being inserted to aid contrast. The starting point is where the tail hangs. You do not need to understand nanotube geometry to follow the instructions, but if you do then the image with ring numbers and the comments relating to the atomic structure may help you. Lets assume that the axis along the nanotube is called the y axiz. Lets call a ring, all atoms with the same y coordinate. Two rings are always crocheted together in a single crochet row, one of each ring alternately. The 0th and first rings are crocheted together, and the second and third etc. In the seven rows of the white nanotube image there are 14 atomic rings. Each atom is at a joining point of three bonds and each 3 chains or double crochet is a bond. These instructions will lead to a tube of any desired length and X atoms per ring. We recommend X be at least 6, it is 8 for the black protoype. Crochet a chain of length seven times X. Join with a slipstitch. This is the 0th and first nanotube rings or first crochet row. 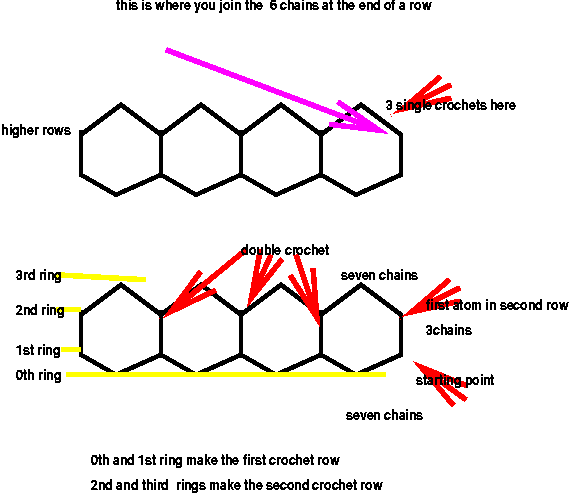 Three chain stitches (up to the first atomic site of the second ring) and then 7 more (to pass atoms in the 0th (below) and 3rd (at the 4th chain) rings and reach the second atom of the second ring). A double crochet to the 7th stitch from the start, connecting atoms of the first and second rings. (Seven chain stiches followed by a double crochet to the seventh chain stitch) X-2 times. Make 3 single crochets, one into that stitch and two into the next 2 chain stitches. Start the next row with 10 chain stitches, followed by a double crochet into the fourth chain after the first double of the row below. Repeat from * till ** till the length is as desired. Complete nanotube with 6 chain stitches and a slipstitch into the 3rd chain from the start of the row, cut thread with a 3 cm tail. Finish off by tidying the starting and finishing tails into the nanotube. Wash if needed and iron with spray starch for a bit of extra stiffness. Good luck and send a picture of your nanotube to phr76ja@tx.technion.ac.il for our nantube gallery. All care has been taken with the instructions but they are written by a physicist and not a professional craft person. Corrections welcome!